The demolition of the “Old” Metropolitan Opera House was the first loss of a potential landmark since the New York City Landmarks Law was passed in 1965. In 1880, dissatisfied with the location and seating capacity of the 1854 Academy of Music opera house near Union Square, a group of wealthy businessmen opted to build their own. 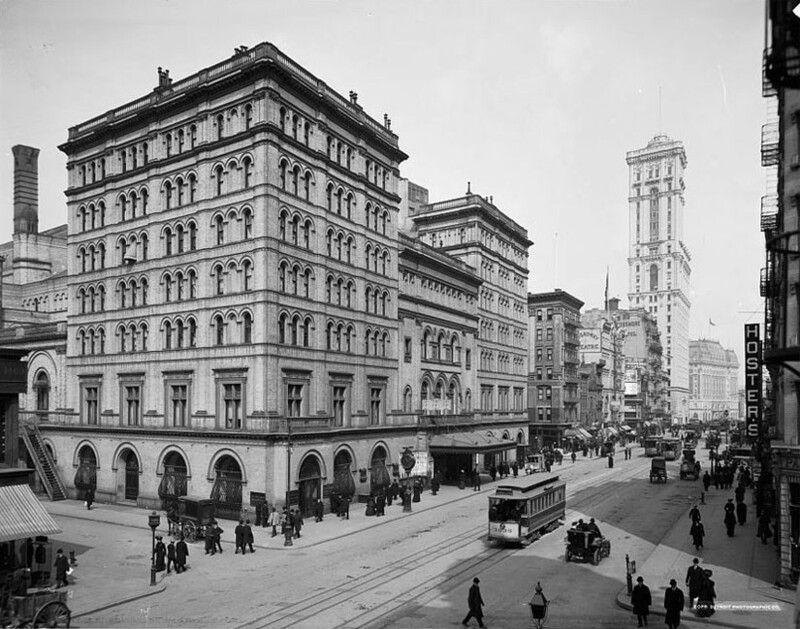 In all, 70 shareholders provided the $1.7 million required to buy the land and build the opera house at West 39th Street and Broadway.1 Occupying the entire western side of the block between West 39th Street and West 40th Street, the “Old” Metropolitan Opera House opened on October 22, 1883. Designed by J. C. Cady, it was nicknamed “The Yellow Brick Brewery” for its industrial looking exterior.2 However, others found the “Old” Metropolitan Opera House’s intimate interior appealing. “I miss that house and not that I’m a great fan of opera but – that house, when you sit on the stage the balconies went straight up and they were only about 15-20 rows back – they were very short,” said Bronson Binger. The theater was gutted by fire in August 1892, but was rebuilt over the next two years along its original lines. In the early 1900s, the opera house underwent another series of transformations. The interior was redesigned in 1903, and in 1906, the signature gold damask stage curtains were installed, completing the look that the “Old” Metropolitan Opera House maintained until its closing. A bitter battle ensued between preservationists and the opera house’s management. Mayor John V. Lindsay and Governor Nelson A. Rockefeller became involved and established the Citizen’s Committee for the Preservation of the Metropolitan Opera House. But the Metropolitan Opera Association sued (eventually winning) and serious preservation efforts were terminated in August 1966. 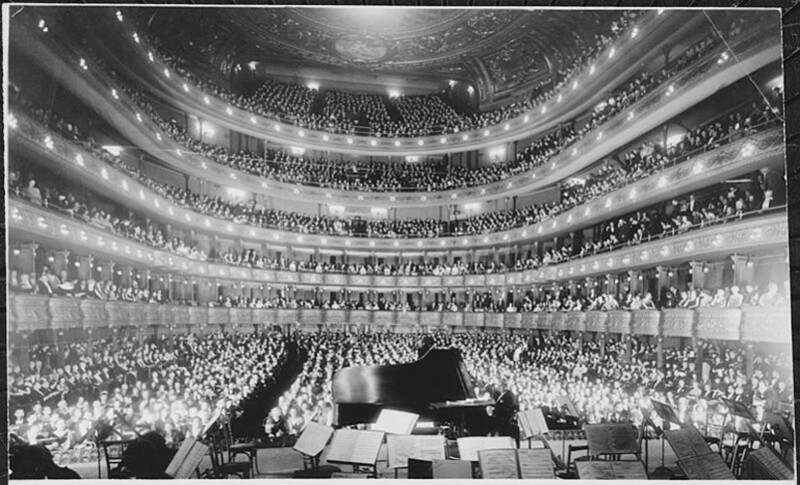 The “Old” Metropolitan Opera House was demolished in January 1967. It was the first loss of a potential landmark since the New York City Landmarks Law was passed in 1965. The "Old" Metropolitan Opera House was among the first structures to be considered by the New York City Landmarks Preservation Commission for landmark status in 1965. However, after a scramble to preserve it, the opera house was destroyed with the Commission's consent in January 1967. In 1970, the World Apparel Center was built on the site. At the same time, there was also considerable controversy over whether the opera house should be preserved with greater emphasis on its exterior or interior. The "Old" Metropolitan Opera House was an admittedly plain building on the exterior. Some have gone so far as to call the building's exterior “famously ugly.”16 Another described the opera house as a “third rate warehouse.”17 This fact had a great influence in 1965 when the building came before the New York City Landmarks Preservation Commission. The lack of aesthetic beauty took “precedence over any consideration of the building’s historic and cultural significance” and the Commission voted against designation.”18 Without designation, the "Old" Metropolitan Opera House was demolished in 1967. However, this was not the end of the discussion regarding the building. In 1973, an amendment was added to the 1965 Landmarks Law that would allow the Commission to designate publicly-accessible interiors. This amendment would only apply to buildings with “interiors that are ‘customarily open’ or accessible to the public,” as was the interior of the opera house.”19 The loss of the "Old" Metropolitan Opera House was used numerous times as an example of why the amendment to the law was necessary. Ed Dinger. “The Metropolitan Opera” Accessed: June 29, 2009. NYPAP, “Bronson Binger Interview with Melissa Brunette,” October 17, 2008. John Briggs, Requiem for a Yellow Brick Brewery: A History of the Metropolitan Opera (Boston: Little, Brown, 1969), p. 359. Christopher Gray, “Streetscapes/The old Metropolitan Opera House; Why Mimi No Longer Dies at Broadway and 39th,” The New York Times, 23 April 1995. “Landmark Drive to Open Sept. 21,” The New York Times, 7 September 1965. NYPAP, Bronson Binger Interview with Melissa Brunette, October 17, 2008. Gregory Gilmartin, Shaping the City: New York and the Municipal Art Society (New York: Clarkson N. Potter, 1995). Paul Goldberger, “City Acts to Protect Interiors of Historic Buildings,” The New York Times, 2 November 1973.